GKE 68 - A Remarkable Odyssey! The bus had entered service from Luton depot, Chatham immediately following delivery in June 1939 as one of a batch of 37 similar buses. Ownership passed to Maidstone & District on 1st October 1955 upon absorption of Chatham Traction by M&D. GKE 68 became DH295 in M&D fleet and was repainted into M&D dark green and cream livery in March 1956. In December 1956 it was sold out of service to Passenger Vehicle Disposals, Dunchurch, Warwickshire, a commercial vehicle dealer. GKE 68 was destined to become the only life-long Chatham Traction bus to survive, and a remarkable survival story it proved to be. 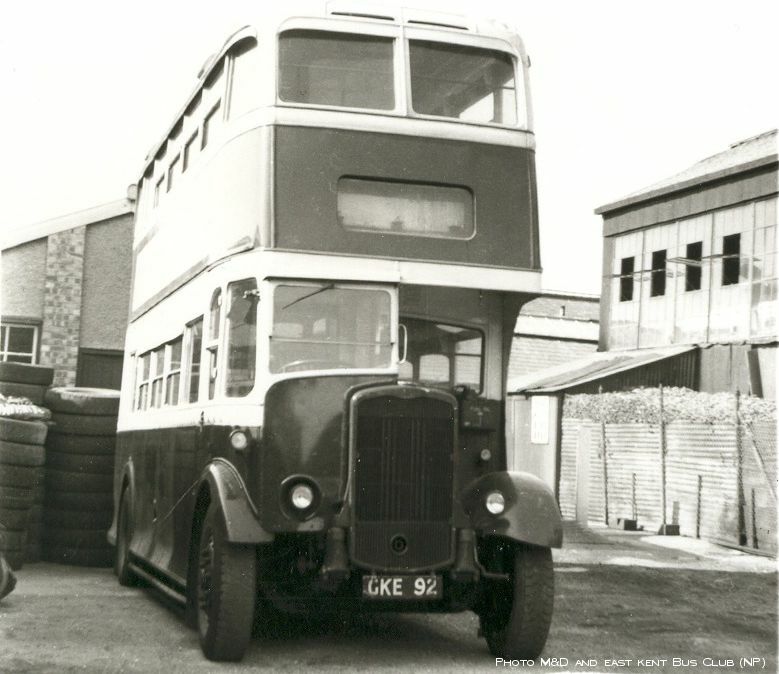 By January 1957 GKE 68 was sold on to Mountain Transport, of London SW3. Mountain had a contract to provide staff transport during the construction of Berkeley nuclear power station in Gloucestershire. Sister vehicle GKE 92 in typical as-withdrawn condition awaiting disposal. Whilst on holiday in the south-west in 1960 former Chatham Traction conductor Brian Smith found the bus parked in a yard. This may not have been a completely chance encounter as Brian, a bus enthusiast, had as a hobby traced the movements and ownership changes of many Chatham Traction vehicles after disposal. Enquiries followed and eventually, on the 18th December 1960, Brian purchased GKE 68 from Mountain for £65. Back in Medway after collection from Mountain Transport. The bus is in the Contractor's dark red and grey colours. December 1960. Renovation work began, assisted by a small support group of M&D and East Kent Bus Club members, and culminated in the bus's first ever MoT test in July 1962. The bus subsequently appeared on the road later in 1962 with support from the Club, and ran its first enthusiast trips in 1963. Clapham Transport Museum trip 1963. Does anyone recognise themselves?! Home for the bus during its early preservation was Grange Farm in Lower Gillingham. An early task was to restore the former Chatham Traction livery. Storage difficulties and some uncertain custodianship during 1970s-80s saw the bus stored for differing periods at Frindsbury, Detling Aerodrome, Staplehurst, and Canvey Island. The demands of upkeep began to outstrip resources, and the bus slowly fell out of use. By September 1986 the bus had passed to Brian Baldry, the Bus Club's Medway group leader by then living in Suffolk, and subsequently in May 1990 to Mrs Baldry as executor. In September 1991 the British Bus Preservation Group became involved in the story. This group had become aware of a threat to the bus and recognised its significance, both as the sole survivor of a distinctive but unrecognised operator and an example of the relatively unusual combination of Bristol chassis and Weymann body. Buyers of the former Baldry home had called in the scrap man to remove a gently decomposing bus from the garden of the house. In what became a last-minute rescue, and a story in itself, BBPG members arranged at very short notice for the vehicle to be towed out and then moved to temporary storage. By Spring 1992 it had been moved to a BBPG store near Hull. The BBPG featured GKE's rescue for an article in its journal describing its activities and its successes in rescuing many significant vehicles from the half-cab era. The accompanying photograph showed the bus during its sojourn in Suffolk. Around August 1993 ownership passed to Bolton preservationist Norman Myers whose death in 1998 resulted in a further ownership change, this time to Roger Burdett. Throughout this period the bus remained in store at the Hull facility. It was around this time, in 2002, that Richard Bourne learnt from the "Classic Buses" website that a Chatham Traction bus was still in existence. Efforts to track down the bus began, largely for nostalgic reasons. Some e-mail dialogue with the BBPG revealed that the vehicle was in the Hull storage facility, inaccessible, but awaiting full restoration under Roger Burdett's auspices, hopefully during 2003. The impending sale of the east Yorkshire premises in 2003 forced the BBPG to seek new homes for the vehicles it contained. GKE was moved once again, in August 2003, this time to another centre for old buses in Staffordshire. Contact with Roger underlined the size of the task to get GKE back into shape. The bodywork needed serious attention after so many years of neglect. However, the bus was complete, still retaining all its detail items - light fittings, handrails and so on. Roger generously agreed to an offer of help and the possibility of the bus returning home again sometime was discussed. Eventually, in early January 2004, Richard gained first sight of the bus. At the Valhalla for old PSVs in Staffordshire, surrounded by some interesting ironmongery. January 2004. It seemed as though a full restoration exercise would at last begin, as Roger Burdett planned to initiate work during 2003. However fate intervened. A rare Bristol G had been found in the USA and the BBPG had persuaded Roger that he should have this as well! The problems in repatriating and restoring this vehicle put GKE on the back burner. In order to maintain a momentum Roger made it known in early 2004 that the bus was available to anyone with the wherewithal and facilities to restore the bus to the sort of standards he would set himself. As an opportunity to gauge the scale of support down in Kent the overall reaction didn't bode well. There had been no response from that quarter to the advertisement placed by Roger in Bus & Coach Preservation magazine at the time (April 2004), and some interest shown by a restoration group working in Chatham Dockyard came to nought. This was a disappointment, but later proved not to be a reflection of the latent level of interest. At Darton, Barnsley, surrounded by the paraphernalia of a working garage. October 2004. Paul Winter of Barnsley ran a commercial vehicle repair business, and restored old vehicles in his spare time. Keen to have a half-cab, and knowing Roger Burdett through a mutual acquaintance, Paul fitted the bill and in May 2004 the bus was off on its travels once more. After establishing contact a visit was made to Paul's premises one Sunday morning in the September. Paul was similarly generous in accommodating the interest of others in progress on the bus, and was pleased to learn of a growth of interest down in Medway. A move to another location in Barnsley in 2005 resulted in the bus of necessity being kept outside once more. This led later to a position where further work on the bus was unlikely in the foreseeable future. Paul made it known in August 2006 that he was prepared to pass the bus on if anyone down in Chatham wanted to take on its restoration. The decision in late December 2006 to form the Friends gave a basis from which to plan a restoration effort. Encouraged by the identified potential for use of the restored bus to help raise awareness of local history and heritage, the group began a search for a base. Further developments in 2007 resulted in a situation where the bus could no longer be accommodated. It was offered to the Friends for safe keeping and, working to a deadline, a move was arranged to temporary storage at Aylesford, generously offered by Nu-Venture. The trip from Barnsley to Kent was completed on 20th November 2007. GKE 68 sets off from Barnsley for Kent. 15th November 2007. GKE 68 was now back to within a few miles from its former stamping ground. Although time had taken its toll of the bus's condition it was still complete with almost all its detail items. We became a registered charity in October 2009. The Friends became the registered keeper from the following month, Paul having formally transferred ownership to us.